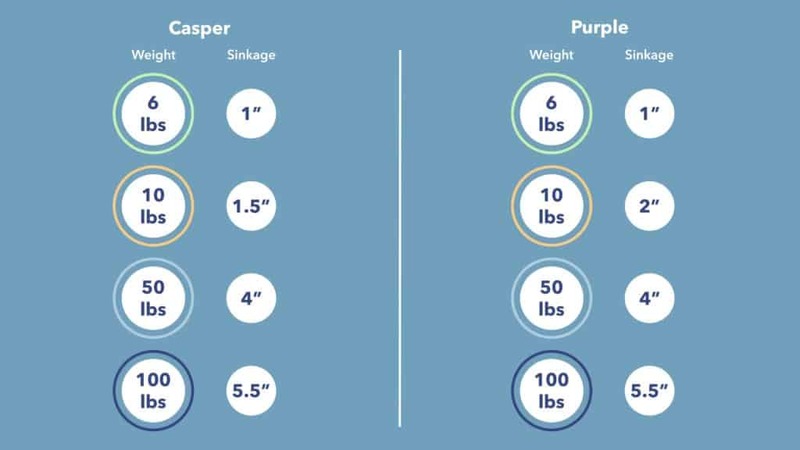 Casper vs Purple Mattress Review - Which Bed Should You Buy? Casper and Purple are some of the biggest and boldest names in the bed-in-a-box game, and for good reason: they are two great, quality mattresses. They were also two of the first in this sub-industry, creating a lot of the “rules” around trial periods, warranty, and customer service expectations. To see how these companies fare when pitted against one another — and to figure out for yourself which one might be a better fit based on your sleep needs — continue reading. 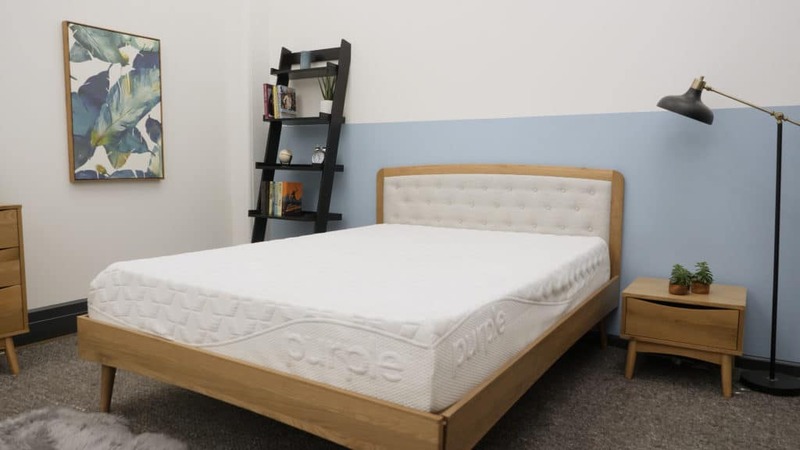 I’m going to walk you through a synopsis of each bed’s specific build and feel, but would also encourage you to read my full review of the Casper and Purple mattresses. If you’re short on time, skip to the bottom for a handy comparison summary, too. Let’s peek inside each mattress to understand what they’re made of, and how this will affect their respective feels. 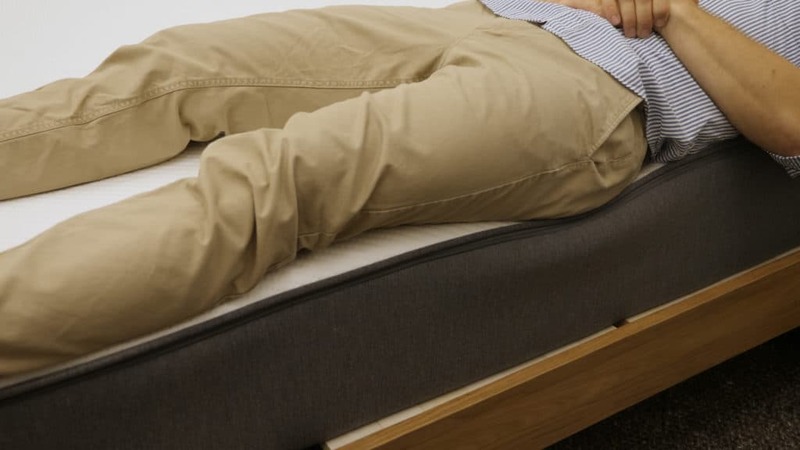 The Casper is an all-foam mattress that comes in at 12” in height. It aims for medium firmness and a healthy bout of pressure relief and comfort. 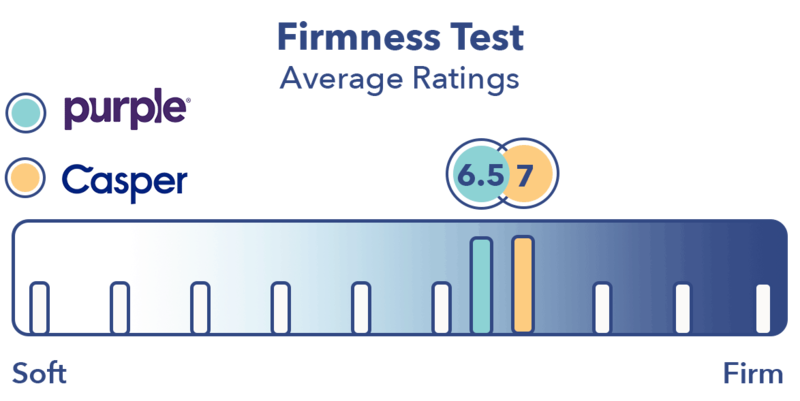 Since Casper only offers one comfort level (medium-firm) the mattress tries to provide a “one size fits all” feel. Now, onto each layer! Cover – The cover is made from a polyester blend. It’s pretty thin but still nice and soft with a cozy feeling to it. Comfort Layer – The top layer of this comfort section is made of a latex-like polyfoam material. 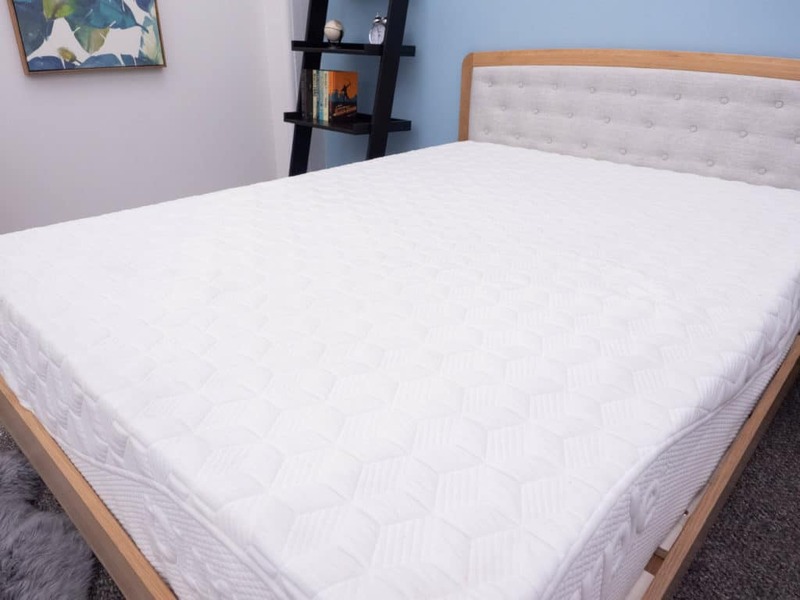 It feels bouncy and has a quick response to pressure, which will help with mobility and also ensures that you won’t feel too “stuck” in the mattress. Beneath the polyfoam is a layer of memory foam. I suspect this is because memory foam can sometimes trap heat and having the polyfoam above will help avoid heat getting trapped. Also, memory foam can sometimes have that hugging feeling that makes people feel “stuck.” The latex on top has a quicker response time to defend against too much sinkage. Transition Layer – This layer is constructed with a firmer polyfoam, which aims to ease you into the firmest foundational layer below. It’s also a zoned-support layer, meaning there will be softer foam near your shoulders and firmer support near your hips. This is especially beneficial for side sleepers! Foundation Layer – The bottom layer is a firm, HD polyfoam base, which is a common material found in bed-in-a-box mattresses. The purpose of this study layer is to give strong support to the overall mattress. Now let’s look at the Purple mattress, which comes in just under 10” and features that unique grid layer. Because no other mattress on the market uses this grid, Purple provides a true, one-of-a-kind feel. Cover – The cover is a combo of polyester, viscose, and lycra materials, the latter of which is often found in athletic clothing. Lycra is stretchy and wicks moisture away so you can stay cool in bed. Comfort Layer – Here is where Purple’s proprietary, hyperelastic polymer grid comes to play. This grid responds quickly to pressure and is really bouncy. It’s also “temperature neutral,” so air will flow through it naturally and won’t trap heat. This layer is also constructed in a grid structure, one of the main differentiates from Casper. As you lay on top of it, the walls of the grid sort of collapse where there is pressure, so you feel contoured without that sometimes obtrusive feeling of being hugged. This is good for pressure relief. Transition Layer – This layer is comprised of that common, HD polyfoam. It’s firmer than the grid above so there’s additional support as you move down to the base of the bed. Foundation Layer – The bottom layer is also made with an HD polyfoam that is even more firm for sturdy support across the entire structure. 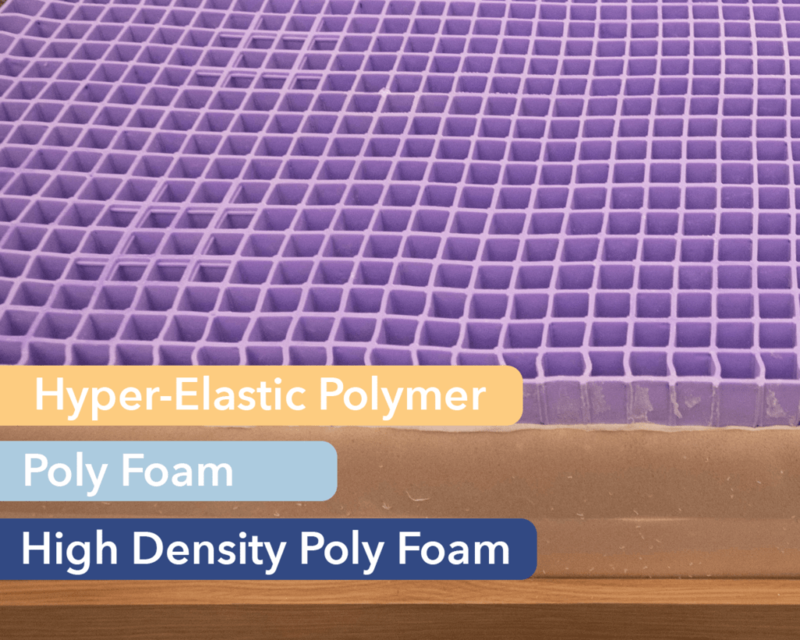 Bounce – Because of Purple’s proprietary, hyperelastic polymer grid, this mattress will feel a lot bouncier, as if you’re floating on top of the mattress. 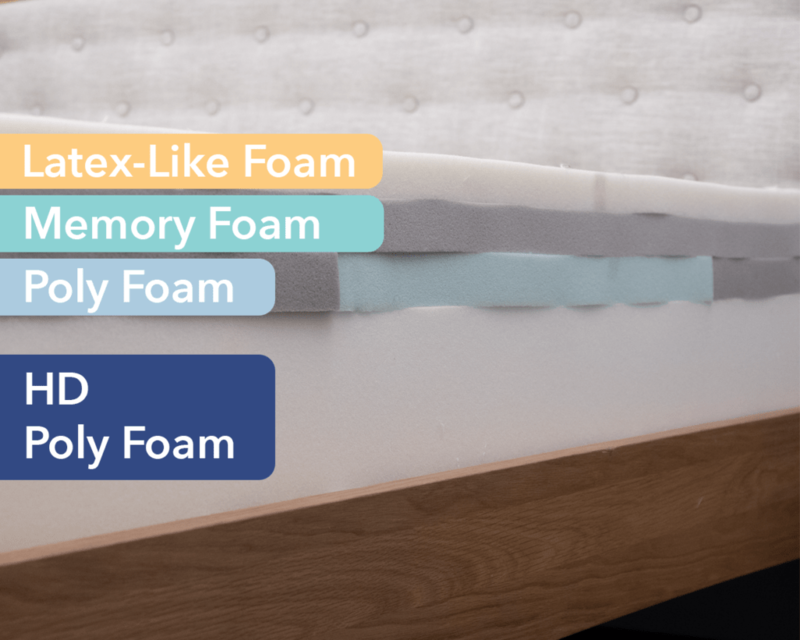 Casper also provides mobility, but the layer of memory foam and the zoned-support poly-foam brings a touch more sinkage and support into your sleep experience. 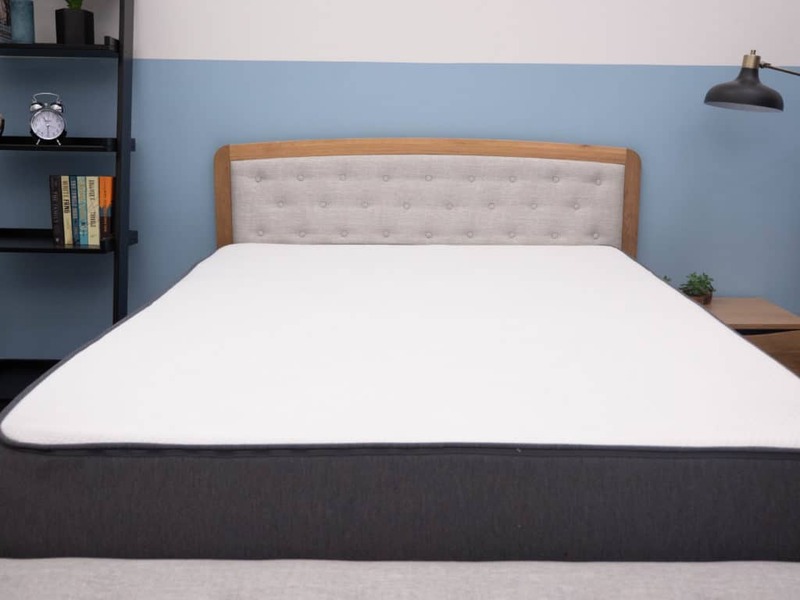 Support – Speaking of the zoned-support, the Casper mattress is designed with a bit more intention when it comes to targeting vulernable pressure points on the body. The layer of zoned-support helps the shoulder have something soft to press into, while the hips have something to keep them from sinking. These slight differences in design also tell us a lot about how we will experience each mattress. To dive more deeply into the feel, continue reading! There are a few key differences to note between how these two beds feel. While how a mattress feels almost always comes down to personal preference, I’ll share with you what I experienced, in hopes it gives you an idea of what you could also expect. I’d give this bed a 6.5 or a 7 out of 10 on the firmness scale, with 10 being the most firm. This means the bed employs a classic, medium firm feel. I can definitely feel that latex-like foam in the comfort layer; it has a great response to pressure and good bounce so I can move around easily. Because of this, I’m certain the bed is good for combo sleepers who enjoy multiple sleep positions throughout the night. The memory foam is also good for pressure relief, and I can feel that zoned support — especially as I roll to my side. Back – My weight is definitely evenly distributed. I sink into the mattress a bit and feel the foam beneath my lower back, but I still get nice support to help with spine alignment thanks to that zoned design. Side – This is where I feel the benefits of the memory foam contouring me, along with that zoned support in my shoulders and hips. My shoulders sink in a bit for some soft contouring, while my hips have sturdier firm underneath to ensure I don’t sink too far into the bed. This is important because sinkage at the shoulders means less pressure at a common problem area, while stronger support at the hips helps keep them from sinking in. This combo helps with spinal alignment, especially for side sleepers. Stomach – The medium-firmness means I have good support all-around. If you are a little heavier or always sleep on your stomach, you might need something a bit more firm to ensure your hips don’t sink into the mattress. This bed also provides a medium firm feel. I’ll give this one a 6.5 out of 10 on the firmness scale, making it a touch softer than the Casper bed. 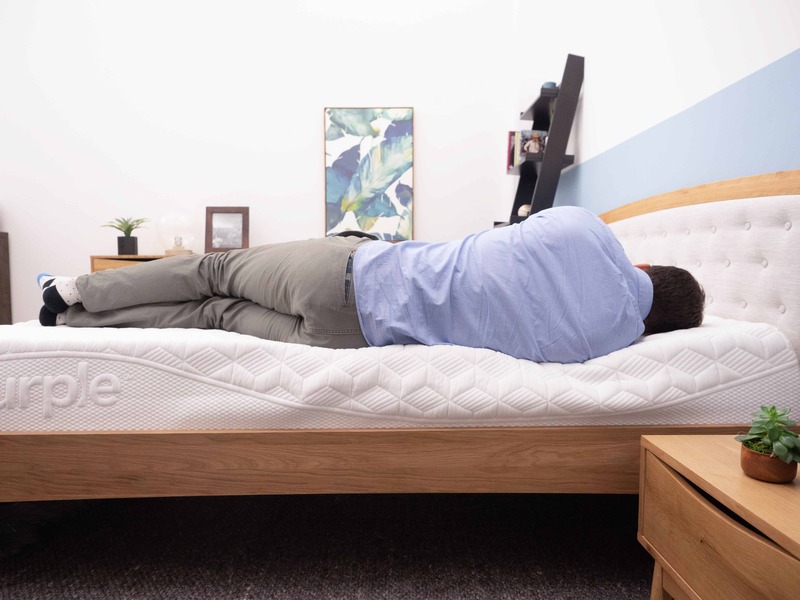 While this mattress also creates a great balance of support and pressure relief, it does feel different from Casper. Let me try to explain. Purple will feel unique because of this grid, which has an extra bouncy feel due to its rubbery quality. To reiterate, wherever I push in on this grid, the walls collapse around it, so you have a super contoured feel, unlike the hugging feeling you get from memory foam. Overall, the grid makes the bed bouncy without feeling trapped. Let’s dive into how I felt in each sleeping position. Side – The grid is interesting on my side, too. I experience that pressure relief, but it’s not the same plush feeling as the Casper. I get that “contouring” feel as the grid collapses around my body, but it’s not a “hug” like that of memory foam. Overall, the medium-firmness here, with the bounce, makes this good for combo sleepers. Stomach – My weight is also evenly distributed on my stomach. This would be pretty nice support for combo sleepers who sleep on their stomach and side. A strict stomach might need something more firm to prevent their hips from sinking too far into the mattress. Testing sinkage and bounce is also important to understanding how you feel and how you will be supported on this bed. It also literally “tests” this idea of sleeping on top of the mattress versus sinking into it. To visualize how your body will respond to each mattress, I’ve placed balls of different sizes and weights (a 6 lb medicine ball, a 10 lb steel ball, a 50 lb medicine ball and a 100 lb medicine ball) on the surface of each mattress and measured how far into the structure they sank. In addition to sinkage, I also tested out bounce by dropping the 10 lb ball on each mattress. The latex-like polyfoam on the Casper has a good bounce to give you that mobility that combo sleepers need. The grid within the Purple provides even more of a bounce that also creates mobility and ensures you feel like you’re floating on top of the bed. In fact, the Purple is actually much bouncier than Casper. While the sinkages are roughly the same, and you shouldn’t worry about a stuck feeling thanks to the latex-like comfort layer in the Casper mattress, the Purple does have more bounce, so it will have more mobility. Both Casper and Purple offer a few different models in addition to the ones we’re reviewing here. Let’s take a look at what they offer so you can learn more about the entire line while comparing it to these original beds here. The Casper Essential is the value option from Casper. You can read more about the Casper Essential in my full review. The Casper Wave is on the opposite side of the spectrum, offering a luxury item to customers. This bed is luxury; the Queen comes in at $2,295. Read my Casper Wave review for all the fine details. 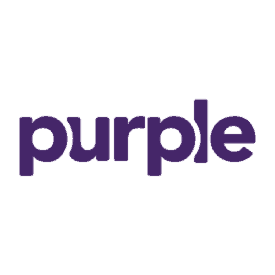 After Purple launched its original mattress, it eventually came out with three newer and more sophisticated models — simply named Purple 2, Purple 3, and Purple 4. Similarly, they come in different firmness levels, also dependent on height (2 is the most firm and 4 is the softest). See my full-comparison of the Original Purple vs New Purple 2, Purple 3, and Purple 4. The first thing to look at is your sleep positions. 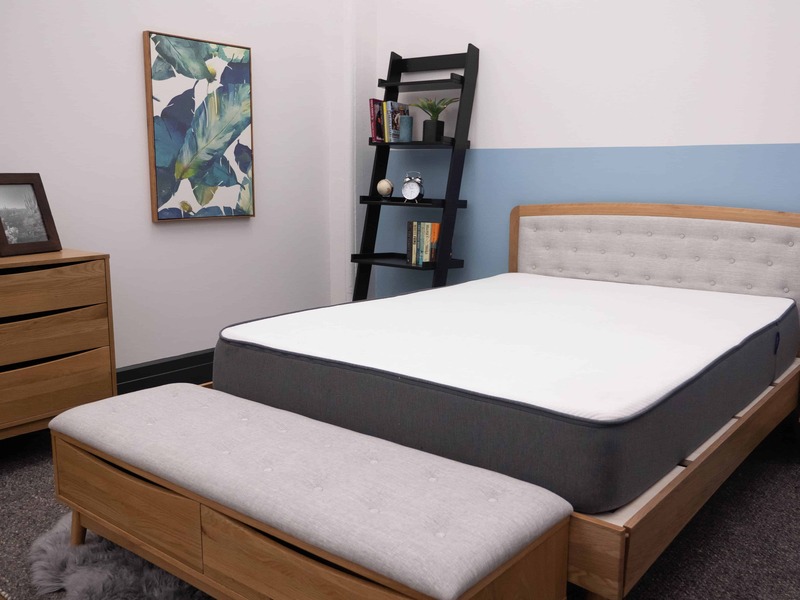 Both beds will provide good support for various sleep positions, yet the Casper has that zoned-support layer specifically designed for people who sleep on their sides. 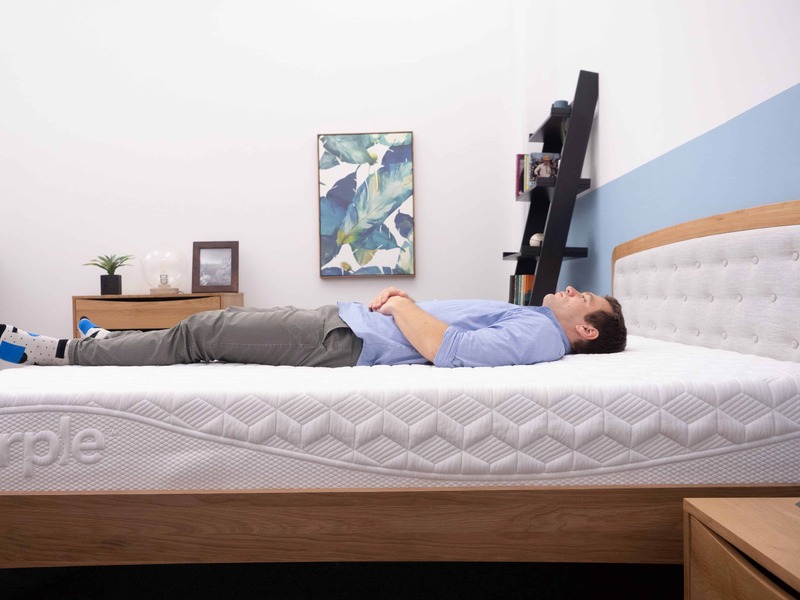 If you enjoy sleeping on your back, Purple really does provide that “floating” feeling and will ensure your weight is evenly distributed while your lower back is supported. The next thing to think about is the bounce. Purple is much bouncier than the Casper mattress. If you’re specifically looking for something that will lift you up and out of bed, go with Casper. However, if you want that cushiony support, then Casper could be the way to go! Finally, let’s talk price. For better or worse, these mattresses are pretty evenly priced, so if you’re still undecided, the price point isn’t going to help you! Still, here’s a breakdown of cost and size so you can compare side-by-side. Zoned Support – This is a nice feature to see in a bed-in-a-box mattress. The zoned support of the Casper really helps your shoulders feel cradled while your hips are supported. This is essential for spine alignment, too. Combo Sleepers – If you sleep in multiple positions, the balanced foam and mobility of the mattress allow you to move around with ease. The Bounce – If you want to feel like you’re floating on top of the mattress, versus feeling stuck in it, the Purple does a great job at being both bouncy and light. That does it for this Casper vs. Purple comparison! If you have any more questions or comments, please feel free to leave a message below!